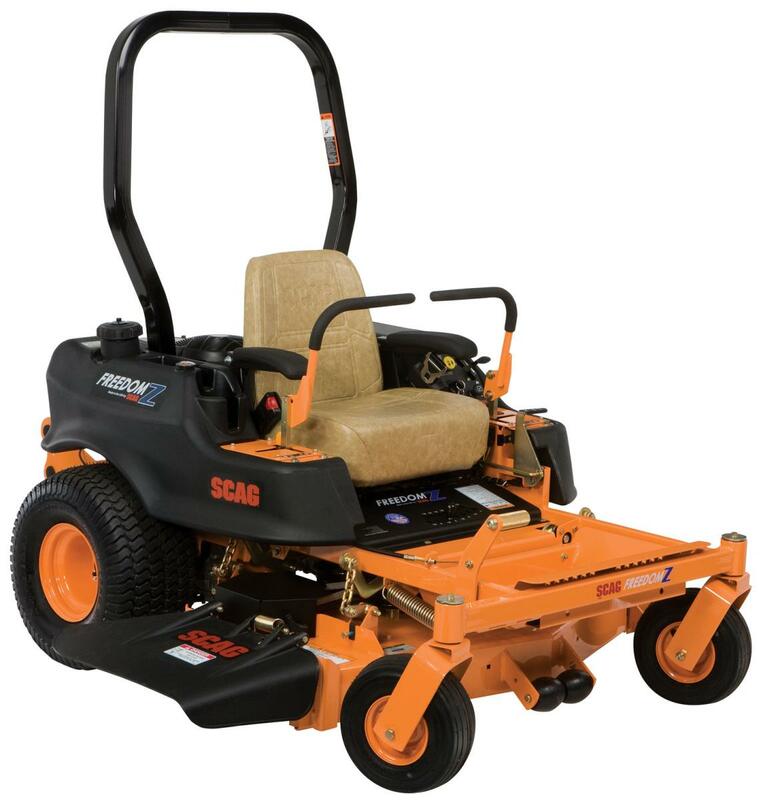 The Scag Freedom Z offers a truly fun mowing experience for everyone. Property owners and commercial users alike love its simple, easy-to-operate and maintain nature. With a well-rounded mix of durability, comfort and performance, the Freedom Z is an easy favorite. Durability. Every part of the Freedom Z is built with longevity in mind. The mower is built around a heavy-duty steel frame anchoring the deck and drive components to a solid base. The tough Velocity Plus steel deck with heavy-duty hardened steel blade spindles make a tenacious player in the lawn and turf competition. The mower has a high-gloss finish with a commercial-grade powder-coat paint. Comfort. The operator’s station features an adjustable thick cushioned seat for optimum comfort. Located next to that, the instrument panel provides easy access to ignition and mower controls. An iso-mounted pierced-steel footplate enhances comfort when navigating rough terrain. A cup holder and storage tray are built into the fuel tank. Large drive tires and front caster tires provide solid traction and a smooth ride. Performance. V-Twin engine from Briggs or Kawasaki (ranging from 18 mph to 27 mph) give a maximum ground speed of up to 10 mph. Get maintenance-free, high-performance operation with the sealed aluminum spindles with ball bearings. The tough Hydro Gear transaxle drive system has charge pumps and all metal gears ensuring a smooth performance every time. The deck engages easily with an Ogura PTO clutch brake. All around, the Freedom Z is a great choice for those in the market for a new zero-turn mower. Multiple engines and cutting deck sizes (48” to 61”) provide a variety of choices in the Freedom Z line-up. Choose a mower that fits your lawn AND your budget.